MoMo 2.0: Is Bigger Better? Interesting question for a Texas gal, huh?! When Mads and I travel, I always search for those things that are the "biggest ______ in the world" or the "oldest_____ in the world" or the "longest _____ in the world". I am not sure if I seek these things out because I am a Texan and obsessed with the biggest and best or if I am really THAT competitive! Either way my discoveries around the world always end up being things that Mads and I agree were WORTH the visit! And our trip to Spain was no different! We visited the BIGGEST (actually "widest in diameter") bullfighting ring in the world in Ronda, Spain. It is a little more than an hour north of Malaga, but SO worth the drive! Not just to see the ring (and the Ronda BULLFIGHTING COLLEGE! ), but because the history in this town has been so well-preserved. Neither of us is too keen on the concept of bullfighting, but we did learn at the Ronda Museum that the Spanish people do not consider it a sport--but rather, an ART. Sidenote: If you do make it to Ronda, one thing you must see is this bridge that connects the "old city" to the new one.... it is an amazing thing to see preserved in the year 2011.. But back to the biggest and the best... just a little further north of Ronda is Sevilla, the place that we decided is our favorite city in Spain (so far, at least!) It is an amazing, relaxed-paced city that offers so much to see and to experience. And it is here that you will find the Seville Cathedral, the LARGEST Gothic Cathedral in the world! It is ABSOLUTELY amazing! It encompasses an entire square in the center of the city and stands so magnificent in the middle of things like tapas restaurants, cafes and even a Starbucks. There was something magical about sitting there in a 2011 setting, looking out the window at the amazing place! Its tower rivals the bell tower of Cologne, Germany's Domkirke (which Mads and I climbed to the top of in August 2008). 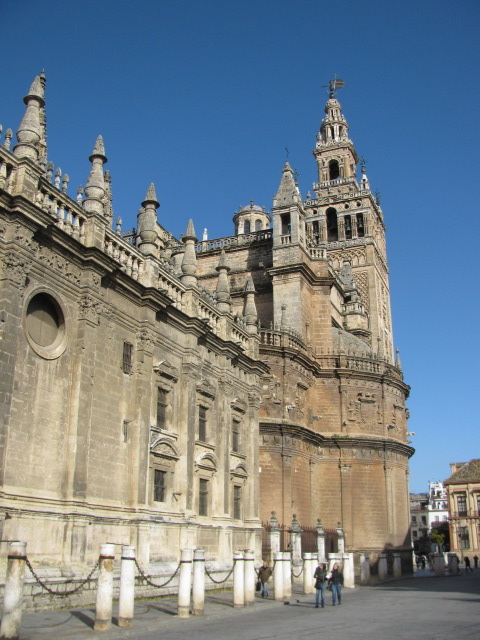 Seville's tower does not have stairs; rather it has inclined ramps all the way up THIRTY FOUR "flights" because they wanted the horses to be able to access it back in the day. We never did find out why the needed horses WAY up there, but hey, the view was worth every step we took to get there! 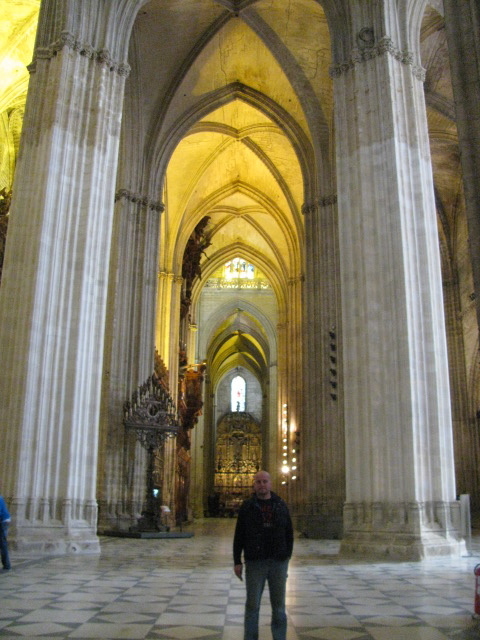 But one thing that makes this place even cooler than just being the "biggest" of something....is that THIS picture was taken INSIDE the Seville Cathedral from the VERY PLACE that Christopher Columbus is buried... How cool is that?! Well, at least this American gal thinks it's pretty cool! Our next trip on our calendar is to Savannah, Georgia...wonder what "biggest" and "oldest" and "most awesomest" things we will discover there?! That bridge is incredible. I would love to see that in person; it's fascinating. And yes, that view is beautiful as well! Lovely pics! Seville is such a wonderful place - makes me long to go back and re-live my youthful days! Those buildings are gorgeous! I can't wait to get over there and see some of those! 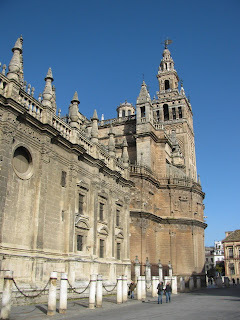 I think Seville is definitely on my list now because of your post! I LOVE church/cathedral art/architecture, and have visited a fair share around Europe...I lived as an exchange student in Cologne and got to take a private tour of the Domkirke, it was AMAZING. If you're into it too, and near Cambridge, England, go to Ely and see their cathedral...so beautiful. Have fun in Georgia...I'm jealous! I would kill for some good Southern cooking right now! We're heading back to Western Washington for this Christmas and CANNOT wait! Not so much "Sætte sit lys under en skæppe" here, which is so much fun! Obviously you are not scared of heights! What an amazing bridge and how amazing to see the burial place of Christopher Columbus. Thanks for the sightseeing trip. Any sunbathing for my Texan Dane? Really he's buried there and not in the USA? Huh, didn't know that, never actually thought about it either but now I do know it thanks to you!! I'd so love to travel with you, you'd be better then any travel guide book I could buy!! Very odd that they'd want horses up in the higher areas of the catherdral, I'm extremely curious as to why they'd want them up there now....hmmm, have to ask if I ever make it there...or you can ask if you go there with us someday ;-) hahaha! Have a great day Kelli!! Found your blog from a comment on Kristen's (Anywhere There is an Airport). Anyway, I like it and I'm glad you enjoyed Spain!